Just 2 and a half hours north of Sydney, Fly Point and Halifax Park are located at Nelson Bay, New South Wales, on the east coast of Australia. These dive sites have an overwhelming variety of sponges, fish and macro life. The two sites, approximately half a mile (800m) apart are designated Marine Reserves, and offer the diver and underwater photographer some of the most exciting and colourful attractions beneath the ³Blue Water Wonderland² of Port Stephens. These are temperate diving sites - 65 degrees (180 C) in winter and 75 degrees (220C) in summer -, both sites comprise of a series of ledges and bommies to a maximum depth of 60 feet (18 metres) at Fly Point and to 100 feet (30 metres) at Halifax Park. Both sites are subject to tides, making for some very exciting drift diving, which takes pace about 2 hours before the high tide, when the current is running at about 2 knots. 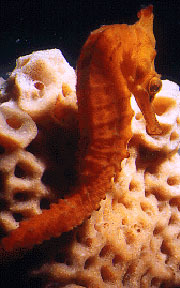 Easy dives are done on the high tide, when visability is at its best, summer 15 - 20 feet (5 to 6 metres) and winter up to 35 feet (10 metres). Bream and black fish patrol the shallow water while wobbygong and Port Jackson sharks relax on the sandy bottom. Blue Groper, some up to 3 feet (1 metre) in length, will come and sit at your shoulder, like a guardian angel and accompany you for the entire dive. 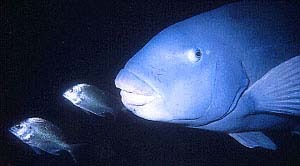 Maroi wrasse, stripeys, angel fish and old wives will follow you on your dive, peer into your mask, gently nibble at you hair or swim between your legs. You will see butter fish, bulleyes, silver drummer, leather jackets, catfish, rock cod, fire fish, angler fish, magpie mowong, banner fish, pomphrets, all living in harmony. 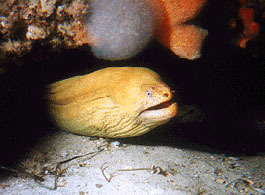 Moray and mosaic eels come out of their holes to say hello and let you tickle them under their chin. 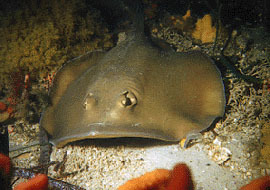 Stingrays go about their business not in the least perturbed by your close presence. The lobster come out from under their ledges to inspect the divers. Pineapple fish share their homes with the lobsters and crabs. Mowongs rest on large orange sponges, catfish create storm like clouds, moving slowly from one ledge to another, bright blue neon damsels dart frantically back and forth to protect their home, puffer fish and porcupine fish hover about looking for their next meal. For the macro photographer and sightseer there are innumerable photo opportunities and delightful encounters with sea spiders, sea horses, some 30 varieties of nudibranchs, pipe fish, cuttlefish, octopus, banded shrimp, dwarf lionfish, dwarf trigger clown fish, gobies, goat fish, fortescues, feather stars, butterfly gurnads, starfish, frog fish, decorated crabs ... and the list goes on! They are all there for your visual enjoyment and even once in a while one of our friendly dolphins or turtles will pass by for a close encounter. Fly Point and Halifax Park are excellent night dives offering divers easy navigation and the chance to see the nocturnal creatures going about their business. The sponges are a visual experience at both sites, brightly coloured in orange, yellow, red, blue, purple and white adding to the general beauty of these sites, with kelp beds close to shore making a home for the more timid of the fish such as pygmy leatherjackets and box fish. Being a local I have dived these sites many times. There is so much to see, enjoy, observe and to learn, it is truly a memorable experience.